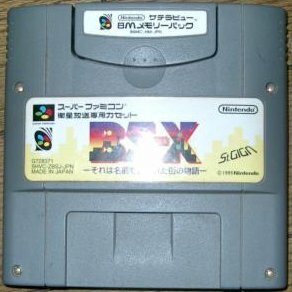 This was an add-on released in Japan for the Super Famicom. It connected below the SFC, where the expansion slot is. This add-on, also known as the Broadcast Satellite, or BS-X, allowed gamers to connected to a satellite feed during certain times of the day, and there would be games to play. Some of these games had time limits, and there were many games that were made excusively for the system. Some of the biggest supporters of this system were Square and Nintendo. The satellite service provider was St. Giga. There were over 100 games, magazines, and demos created for the BS. Many of them were dumped out and distributed on the internet, but are not fully emulated as of yet. Some of the more interesting games include a remake of the original Legend of Zelda, Radical Dreamers (a text adventure based in the Chrono Trigger universe), Excitebike (with Mario characters), and episodes of popular snes games like Super Mario Bros 2, Super Mario Bros 3, and Legend of Zelda: A Link to the Past.